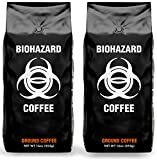 Biohazard is a highly caffeinated coffee made from robusta coffee beans. The above caffeine amount reflects the use of 4 tablespoons of Biohazard Coffee and a brewing method that allows for prolonged contact with the ground coffee and water. Warning! 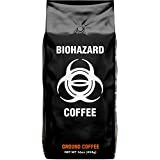 Biohazard Coffee is extremely caffeinated and shouldn't be used by casual coffee drinkers. It is intended for those who have built up a high tolerance to caffeine or those who are hyposensitive to the caffeine molecule. It contains 4 to 5 times more caffeine than a traditional 12-ounce coffee made at home. Use our coffee calculator to determine your safe daily dose of Biohazard. Biohazard isn't suitable for children, pregnant women, or those with hypertension or underlying heart conditions. 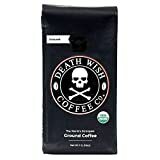 Biohazard is part of our 12 Most Deadliest Coffee Brands list. Robusta coffee beans and water. 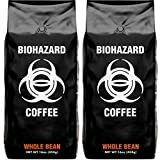 Biohazard Coffee contains 77.33 mgs of caffeine per fluid ounce (261.50mg/100 ml).